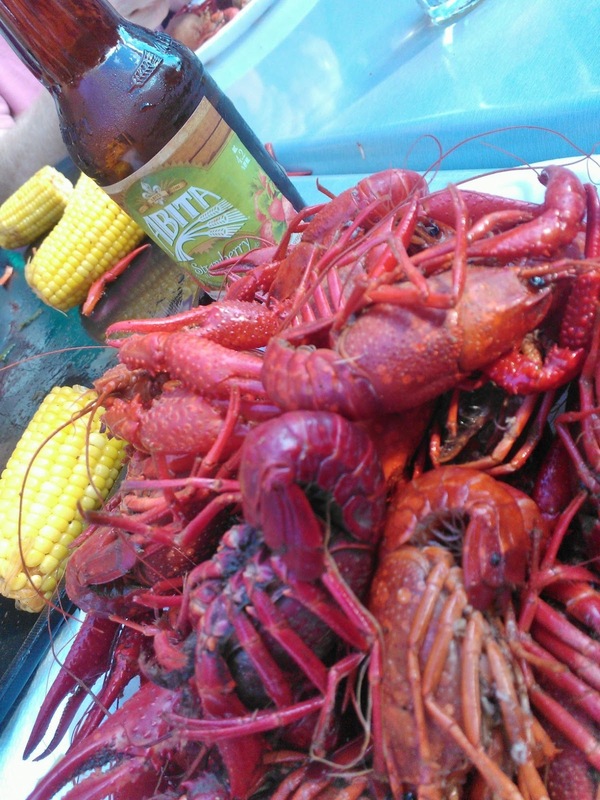 Earlier this week, and much to our dismay, we discovered that the local Emeril's affiliate restaurant, E2, has held a crawfish boil every Friday in May. Having missed the previous four, Mrs. Gilbert and I were determined to make it to the last one. 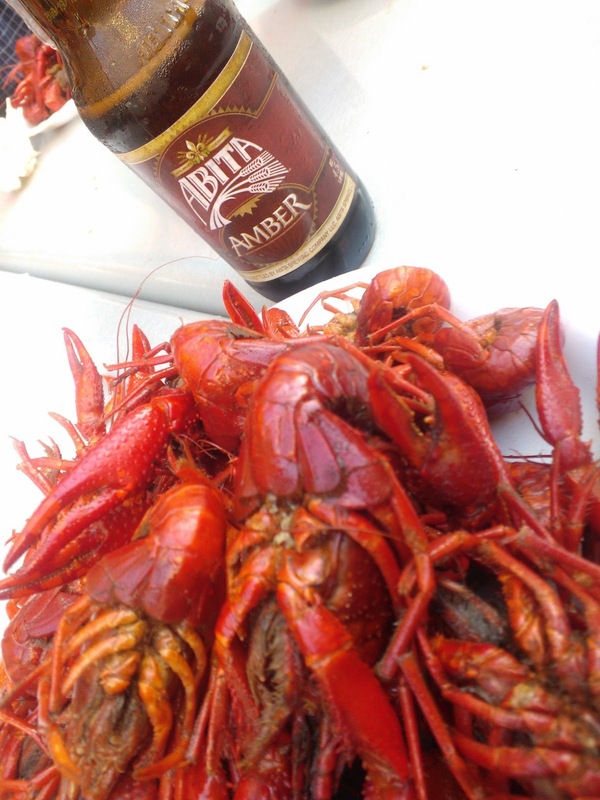 Crawfish is a seasonal delight, and the season is drawing to an end. 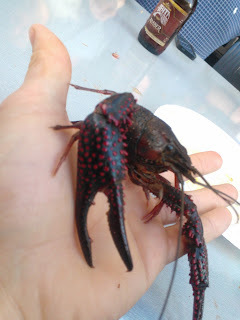 I've talked here before about my love of crawfish, and my displeasure about living in a place where they are a rare find. So when we learned that a local restaurant was going to host a boil, we were all over it. We arrived an hour early so we could get a good seat, and found that most of the seats at the big table were already spoken for. We ended up at the far end, almost right next to the boiling pots, which made things a bit warm, and caused us to have to talk even louder than normal to be heard over the jet engine-like roar of the propane boilers. But they were hardships I was willing to brave. ﻿﻿﻿﻿To our delight, the event became a meeting of Louisiana ex-pats in Charlotte. We sat next to a family originally from Baton Rouge, and later met a young man from Morgan City. There were other folks we met, including a young guy who had spent his childhood in New Orleans. There were plenty of LSU shirts, and purple and gold in abundance. To our even greater delight, we learned that the gentleman who would be doing the boiling was from Breaux Bridge, Louisiana. We immediately knew we were in for a treat, and that the crawfish would be cooked right. 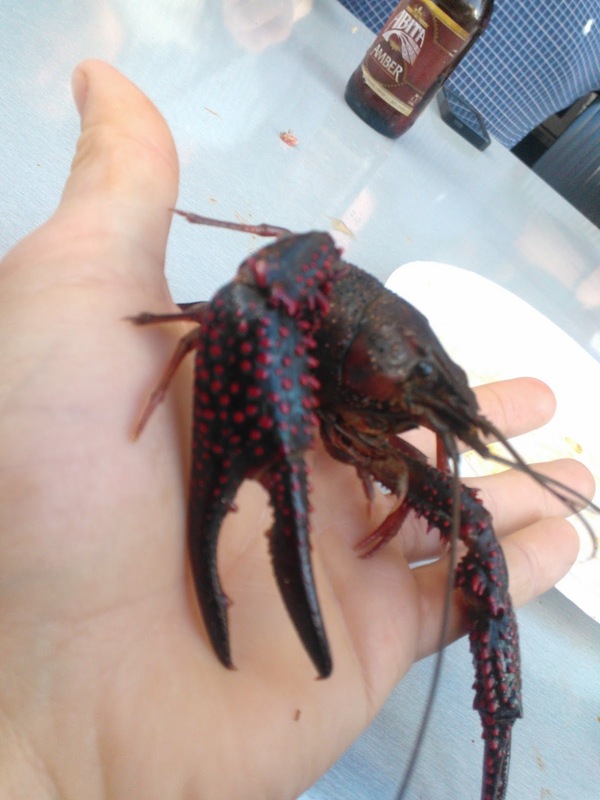 We have attended some other crawfish boils here in Charlotte that were a bit of a disappointment; either the portions are too small, the seasoning is not spicy enough, or the person boiling just plain doesn't know what they are doing. But when Mr. Landry, the boiler, opened his mouth, our spirits soared, and we knew we were in good hands. If you're not a Louisianian in exile, it's a hard thing to explain, but hearing an honest-to-God Cajun accent in a faraway land is a thing that puts happiness in my heart. (I will admit to watching the semi-exploitative TV show "Swamp People" just so I can hear a little of the music of home). I guess the closest thing I could compare it to is someone from a coastal area catching a whiff of salt air while exiled in the Midwest, or a Floridian enjoying the warmest summer day in Wyoming. And Landry is like Smith or Jones among the Cajuns; the town of Breaux Bridge has been named "The Crawfish Capital of the World" by decree of the Louisiana State Legislature. 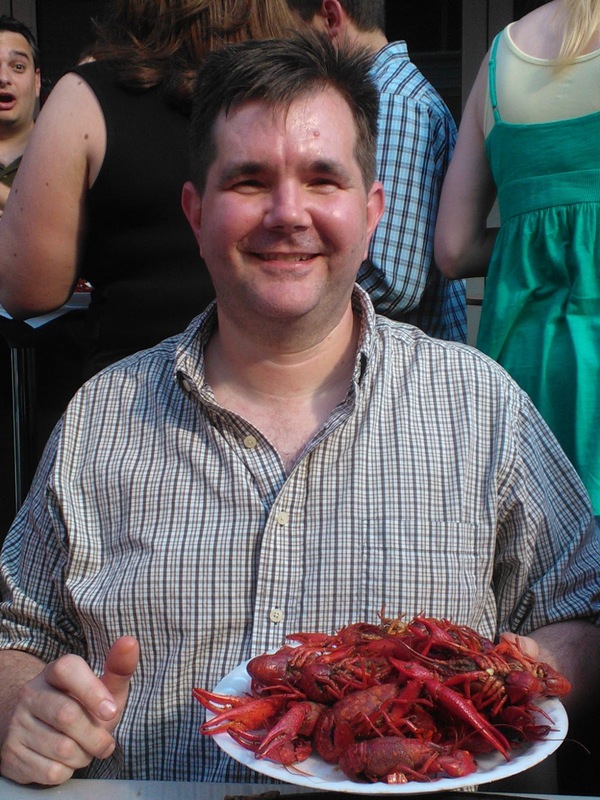 I had no doubt that the crawfish would be delicious, and when they rolled out 240 pounds of them, in no short supply. The first batch is always the spiciest, and that's fine with Mrs. Gilbert and I, because it always shakes out the amateurs. However, this was clearly not the first crawfish boil for the bulk of the crowd. We saw far fewer people drop out after the first round than we expected. Truly, we were among our tribe. We dug in, and polished off the first tray in record time, washing them down with ice cold Abita beer. Typical of late season 'bugs the shells were a bit harder, but they were also monster sized. There were chunks of Andouille, corn, potatoes and to my continuing delight, even mushrooms in the mix. Mr. Landry did indeed know exactly what he was doing. The successive batches kept coming, and we kept quenching the fire on our lips with Abita Ambers and Strawberry Harvests (a bargain at 3$ a pop). And after 90 minutes the crowd did thin a little bit. But not us, we were committed to sit and eat until all the 'bugs were gone. After all, they were the last of the season! So, I'd like to extend my great thanks to everyone at E2 involved with this boil. All you can eat crawfish for five bucks a pop, reasonably priced beers in the heart of Uptown Charlotte, and a boil done right? You could not have done more to win the heart of this NOLA boy. I went home with fire on my lips and under my fingernails. We will definitely be in for dinner sometime in the near future. There was talk from the staff that while crawfish season had ended, they would probably be doing Friday evening Cochon de Laits in June. This is a Cajun version of what is known in these parts as a pig pickin', or barbecue. If that's the case, you'll definitely see us there!